The winter nor'easter has landed in southwest Nova Scotia! The winds are howling and we're experiencing blizzard like conditions already. It's nice to be on this side of the glass looking out while sitting by the roaring fire! Recuperation from this surgery is going to be a long one but with each passing day, I can see and feel a little improvement. The healing pain is totally different from the debilitating kind that I've had to withstand for the past year and a half. Although I'm housebound for 6 weeks, my spirits remain high and I finally feel like the time has come to pick up needle and thread again. I've missed it! I've had a lot of time to think, ponder and reminisce over the past couple of weeks about what the future holds in store for me and I've come to the decision that I will no longer be designing quilts and related projects to sell as patterns. The current patterns that I have for sale in my ETSY shop will be retired once they've sold out. But that doesn't mean that I'll stop designing. The creative part of my brain never shuts down and I love to come up with new designs. As a matter of fact, that's what been keeping my mind and hands busy over the last couple of weeks since I've been home. I'll still be designing projects for Primitive Quilts & Projects magazine. As a matter of fact, I'm committed to two more designs for future issues. The line drawings are done and as soon as I can make it up to my sewing studio, they'll be the first projects that I'll be working on. As time and energy permit, I'll be sharing some of my new designs with you as I did with my First Friday Freebies, but not on a regular timeline. My dream is for this all to be spontaneous and pressure/stress-free for me. When ready, they will be made available as free downloads here. There might even be a free BOM or two! So on this cold and blustery day, I don't have to tell you where you can find Frankie and Ollie and me...sitting by the fire, toasty and warm. I want to thank you all for your continued thoughts and prayers. You all continue to be the bright spot in my sometime long days...and nights. There really is "no place like home". In the wee hours of the morning on January 3rd, I was taken by ambulance to the hospital. Without going into too much detail, the doctors confirmed that the hip I had fractured back in August of 2013 had fractured again as a result of it never having healed properly the first time. After five hours in the OR, they "un-did" the original procedure, replaced it with a "new and improved" hip which hopefully will do the trick this time. So after spending 12 days in the hospital, I was finally able to return home yesterday. Even though the road to recovery will be a long one, I'm in it for the duration. My fabric and wool stash is just screaming at me to be used and that's exactly what I plan on doing as soon as I'm able. Thank goodness I had some hand work prepped before this all happened because at least now I can sit and stitch and sketch. One of the many restrictions that I have to deal with is that I can't put more than 40 lbs of weight on my operated leg for the next 6 weeks which means that with Mr. Painted Quilt's help, I can travel from the kitchen, to the living room/bedroom and restroom with a walker. He's the best care giver that a gal could have...not a great cook but he sure can make a mean sandwich! 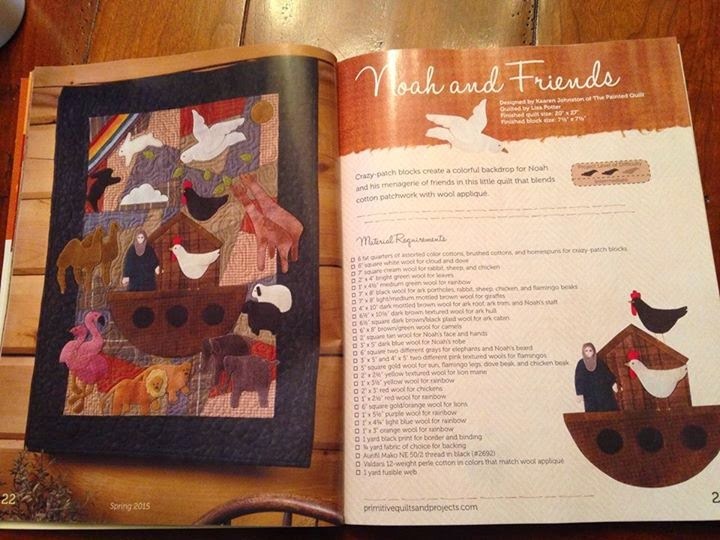 Although I haven't received my copy yet, one of the surprises that was waiting for me when I got home was to find out that the Spring 2015 issue of Primitive Quilts & Projects is now available and that my "Noah & Friends" is one of the projects in the magazine. Thank you Gayle for sending me the photo that she took directly from the magazine so I could see it. I hope you like it! Thank you again for your continued support and friendship. I have one more favor to ask and that is to keep me and Mr. Painted Quilt in your thoughts and prayers. 2015...I like the sound of it. I have much to be thankful for...my family, friends, hobbies, a warm house, lots of food in the pantry and for the most part, my health. Right now I am house bound because of recurring problems with the hip that fractured from the radiation treatments about a year and a half ago. The pain is such that I cannot go up and down the stairs so we have again moved our bedroom into the living room downstairs. That's not a problem except for the fact that my sewing room is UPSTAIRS! Horrors! On the bright side of things, I was finally able to finish the heavy socks I had started three years ago while I was away for my cancer treatments. I had a difficult time getting back to working on them because of the bittersweet memories they conjured up but suffice it to say they're now done and are ready to grace Mr. Painted Quilt's feet. I have also reworked the line drawings for the last five blocks of Leanne Beasley's Down in the Garden quilt and I'm hoping to get those transferred onto the prepped fabric sometime today. Then I'll have plenty of handwork to keep me busy! 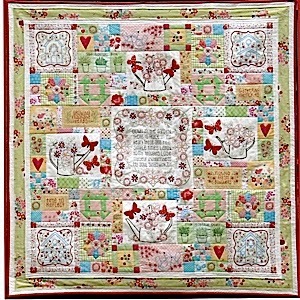 Below is a photo of Leanne's finished quilt. Mine will end up being substantially different. One of the Facebook wool applique groups that I belong to decided to have a stitch along using one of Norma Whaley's patterns called Winter Wonderland. My pattern arrived on Monday...wouldn't you know it? We'll all be starting to work on the first part whenever we can this month. It is our intention that this will be a non-structured, no pressure kind of sew along and our goal is to finish one designated section per month. If you'd like to find out more or join in, you must have a Facebook account and look up "Winter Wonderland Stitch-a-Long" and ask to become a member. I have tons of wool in my stash but after reading over the pattern, I decided that I needed some homespun yardage and ordered a kit from one of the gals from the group who has a quilt/wool shop in Maine. Hopefully I'll have this hip thing sorted out by the time the homespun fabric arrives so that I don't fall too far behind! So while Ollie and Mr. PQ are outdoors bringing in some wood from the barn, Frankie is chilling solo by the fire. It won't be too long before Ollie joins him, especially after working so diligently at bringing in the wood. 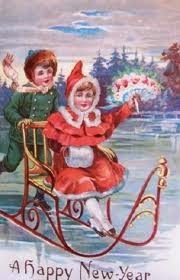 I'd like to take this opportunity to wish you all a very Happy New Year! I hope it is one that is filled with health, happiness and prosperity. Thank you all for your friendship.